Hiya! 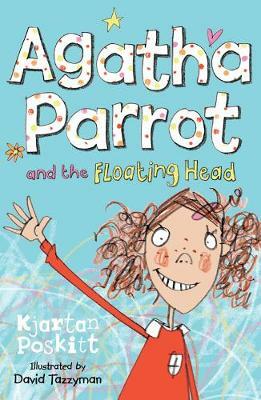 This book is about Odd Street School where I go along with mad Ivy who always jumps down stairs four at a time WAHOO! And Martha who is big and jolly and can sort out boys. The oddest teacher we've got is Miss Barking who wears goggles and gloves to use a pencil sharpener. The story is about when she tried to execute Martha with a floppy cardboard axe, but instead Martha's head floated off and exploded ha ha brilliant! Don't worry. Martha ends up eating an ice cream... but if you want to know how, then you'll have to read the insides, won't you? WOW how exciting - da-da-darrrrrrh! As well as stories you'll get the full gory guide to school life, such as Miss Barking's daft plan to hold a sports day without any winners, how to make the most of just having one line in the school play, the secret teacher beauty competition and how to cure a highly infectious outbreak of invisible spots. Hope you like it, and thanks for reading this BLURB! This book had funny illustrations and brilliant describing words. I enjoyed this book because it was funny.